Top picture. 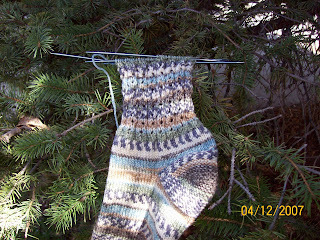 Toe and foot of Eyelet rib sock #2. Next picture. Eyelet rib sock #1 showing more of cuff. Burgundy sock, still on needles after months and months...oh sigh. The joke, when we first moved to Idaho, 25 years ago, was "If you don't like the weather, wait 20 minutes." 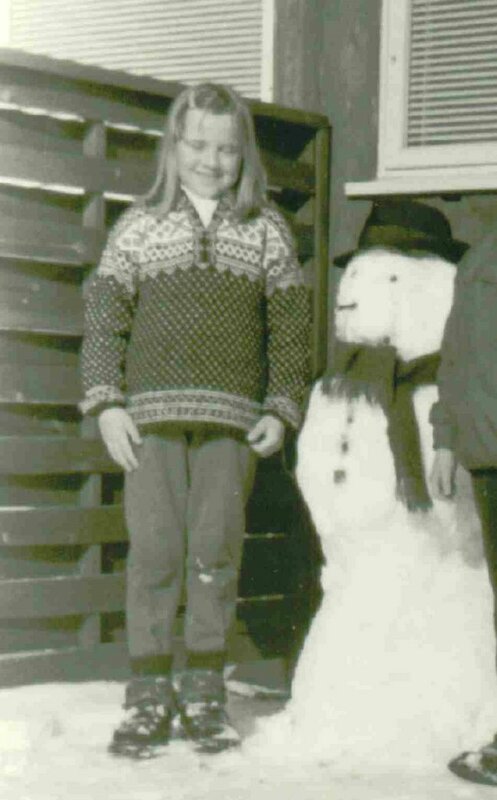 It's not quite that changeable, but it's not uncommon this time of year to have snow one day and two or three days later enjoy temperatures in the 60s. Why do I mention this, you ask? Last Friday and Saturday the weather was perfect - just like I hope it is in heaven. Sunshine and warm temperatures. Sunday it rained most of the day and was cold. Monday - sunny again but still pretty chilly. Tuesday - cold and windy, making the wind-chill temp nearly unbearable. And last night??? It Froze! So much for peaches on our peach tree this year. Drat! I've started sock #2 of the Eyelet Rib socks. Nope, didn't get sock #1 completely done, but I don't want to knit the leg too far and then discover that I don't have enough yarn to knit the second sock to the same length. I really, really do like the eyelet rib pattern and I'm already thinking about the next socks to cast-on after these socks are finished. Question: Why do I think that I need to purchase more sock yarn, when I have enough in my (tiny little) stash for at least 4 more pairs of socks and I do have at least one pair languishing on needles somewhere (besides the Eyelet Rib socks - they're not languishing but they are on the needles) Maybe part of the "problem" is that within my sock-yarn-stash I have yarn for two pair intended for the Curmudgeon - dark grey and dark heathery blue. This time of year that yarn is about as appealing as cleaning gutters. I do have this lovely, springy-summery yarn sent to my by this wonderful blogger way back last summer...(I ended up frogging it all the way back to nothing because I wasn't happy with how it was turning out - no fault of the yarn, which I love.) 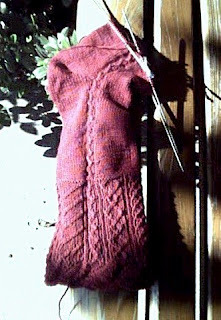 And I also have some "when-I-get-old-I-shall-wear-purple-and-red" yarn from Knit Picks - but it looks pretty wintry, too. 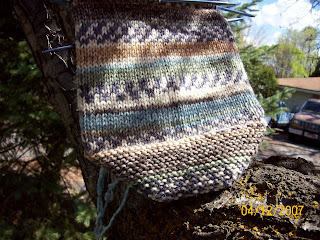 And, speaking of next-socks-on-the-needles, I love the look of the eye of partridge stitch heels seen here (the April 11th post). I'm of the short-row-heel persuasion rather than the heel-flap persuasion, so I'm going to see if the eye-of-partridge stitch will lend itself to short-row heels. I'll let you know if it turns out. I am getting very frustrated with my lack of ability to (figure out how to) control the placement of pictures within my blog entries. No matter where I try to insert them, they always appear at the beginning of my blog entry. I'm wondering if the problem is ME (most likely) or if I need to pursue a different blog host. I've gone through the help section with blogger.com and can't find any help at all. I've tried to contact blogger.com and haven't gotten any satisfaction there, either. So, please accept my apologies for not strategically placing pictures throughout the text of each post. I would if I only could! Meanwhile, speaking of languishing, I found this site today. I predict that it shall we well fed with projects-that-are-taking-way-too-long. I'd send them a post about my burgundy socks, but honestly - a sock seems like such a short little project when compared to some of the projects shown on Slogalong. All of which, btw, are gorgeous. Love your eyelet rib socks! The only way to control the picture placement is to cut and paste them to where you want them. Just click on a picture in the compose mode and copy, cut and paste with the usual commands as if you were writing a Word document. Just right click on the picture and use the commands that pop up. Or use Ctrl-C, Ctrl-V, Ctrl-X.